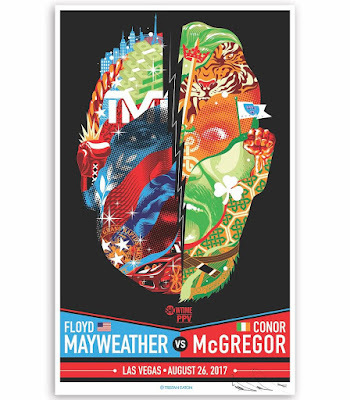 If you haven’t heard, Tristan Eaton was chosen by Showtime Boxing to design the official fight poster for this weekend’s huge boxing match, The Money Fight a.k.a. Floyd Mayweather Jr. vs Conor McGregor! How awesome is that news!?! I guess the most hyped boxing match in years deserves an insane promotional poster. Tristan’s design is amazing, and has The Blot even more excited for this clash of boxing and MMA superstars. The Mayweather vs McGregor Fight Poster by Tristan Eaton is a 24”x39” signed and numbered 14 color screen print. Limited to 250 pieces, this instant classic print will go on sale at noon PST this Thursday, August 24th, at Tristan Eaton’s online store for $300.